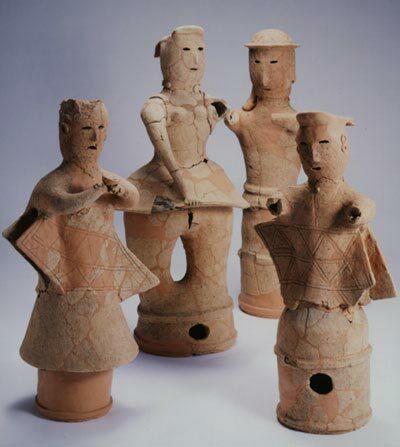 Haniwa resembling those found at Imashirozuka are recovered. Did regional chiefs adopt the mortuary rituals used by the central powers? Recovered human figurines The two haniwa in the foreground are female figurines wearing a cloak resembling a Buddhist priest’s stole; the one in back to the left is a female wearing a cord used to tuck up the sleeves of her garment, while with her right hand she rolls up the hem. The item in back to the right is a male figurine. Photos courtesy of Shintomi municipal board of education. 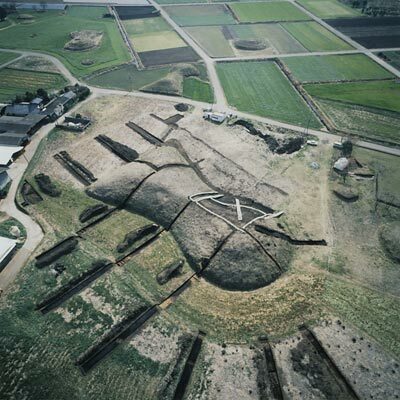 Mukadezuka is keyhole-shaped tomb dating from the first half of the sixth century, located on a tableland on the left bank of the Hitotsuse river, flowing through the northern portion of the Miyazaki plain. At the Nyūtabaru Tomb Group, the designated historic site which includes this tomb, many keyhole tombs were built in the latter half of the Kofun period, comprising the largest group of late period chiefly tombs for the Hyūga region. The mound was built in two tiers, and surrounded by a shield-shaped moat and outer rampart. The opening to a horizontal chamber was found on the western side of the round portion of the mound near the constriction, and in the moat there was a land bridge leading toward the chamber. 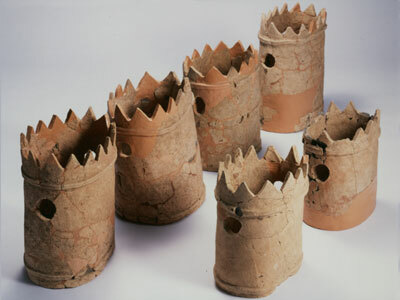 Rows of cylindrical haniwa were set up across both tiers of the mound, with shield-shaped haniwa also erected. In addition, shield-bearing human figurines were set up at one sector of the outer rampart. 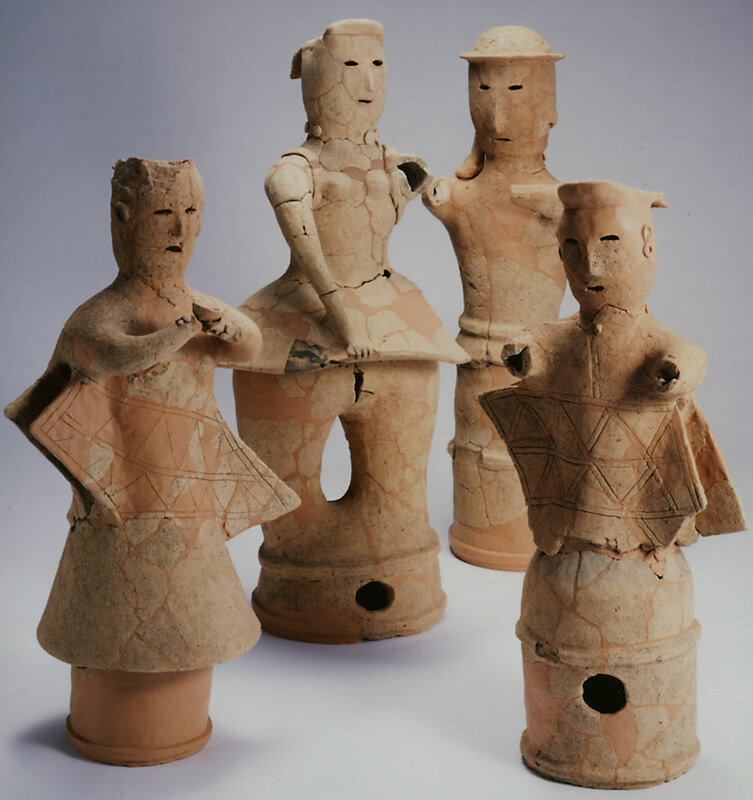 It is thought that the builders of the tomb hoped to protect the grave from evil spirits approaching the mound, by setting up haniwa in the shape of such items as shields, having a defensive function. 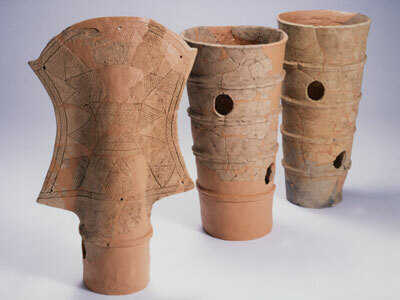 In the excavation of 1997 that accompanied designation as a historic site, large numbers of representational haniwa were found in the vicinity of the western side of the outer rampart. Originally lined up atop the rampart, shortly after the completion of the mound these haniwa were removed and fell into the moat or to the rampart’s outer side. They appear to number more than sixty items, and their types include human and animal (horse, dog, boar, deer) figurines, and items in the shapes of waterfowl, houses, fences, swords, armor, and drums. As they had been removed, the manner in which they were set up atop the rampart is not understood, but it appears there were areas of houses and human figurines in sectors delineated by fences, and another area of human and animal figurines.